I must have been12 years old when I first saw the W215 Mercedes-Benz CL500. I was doing a technology project on cars at school and one weekend I decided to get on my bike and cycle to as many car dealers as I could in Ipswich to gather as many brochures as possible to so I could cut them up and make some amazing display for my school. I think I had more luck obtaining literature from dealers then than I do now. Porsche sent me a load of great info on the at-the-time brand new Boxster and also a lovely book on the 996 variant 911 and Jaguar were also very generous. But I mainly remember being in the Mercedes dealership, and seeing this beautiful, shiny, huge piece of metal and thinking “Wow, one day I want to have one of these!” And that’s probably one of the key moments in my life were I knew I was going to be into cars and that they were probably going to play a huge part in my time here on Earth. The receptionist was great too, really helpful and very generous with the current published stock. She gave me the usual stack of glossy paper brochures for the C, and E class and then she handed me two hard backed books. One was for the W220 S class and the other for W215 CL class. Needless to say these never made it into the presentation for school. These were way too important to me. I must have read each one cover to cover a hundred times, which I know is sad for a 12 year old, but that’s what I was like. I didn’t care about dragons, or wizards, or trips to middle earth, all I wanted to read about was V8 engines, the amazing steps in automotive technology like the radar-guided cruise control and bi-xenon head lamps… It took me another 12 years to get behind the wheel of a W215 CL class, and then 10 minutes to buy it. Heart didn’t even think about head then, I just remembered back to that short, blonde scruffy 12 year old on BMX bike gawping over the 5 meters of metallic silver paintwork and the deal was done. 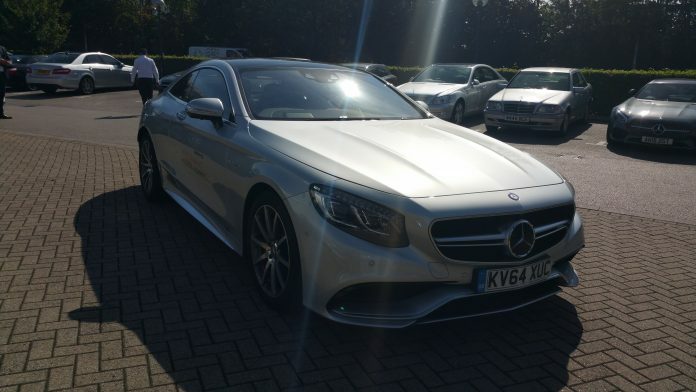 SO little over a year ago, Mercedes announced the new S class coupe, the truly gorgeous W217 and a few weeks later, I was invited to attend an AMG Performance Tour session at Robinsons Mercedes-Benz of Cambridge to see the new AMG S63 Coupe being unveiled and to have a bit of a play with some of the current AMG range. Unfortunately I couldn’t get my name down in time to get behind the wheel of the S63, but I did manage to take the ML63 and C63 Coupe for a bit of a blast to Newmarket and back. Both were brilliant and I especially loved the sheer power and poise of the C63. However, when I left I couldn’t help but feel a little gutted that I didn’t get to experience the car that I was actually there to see, and since then, I’ve been waiting for another invite to give one a go. When the day finally arrived, it couldn’t have been better. The sun was was out and the roads were nice and dry (unlike the previous event which was on a wet and grey day in November). I arrived early, as usual, and made my way to the reception where I was introduced to my AMG Performance Tour rep and we went through all the usual boring paperwork before we ever do these things and we talked a bit about the cars and then we headed out into the car park to get into the first car. When he fired up the engine to the S63, I went a bit weak. I know the S coupe is supposed to be a civilised motorway eating cloud of a car, but the noise those twin-turbo 5.5 litre V8 engines make when they are cold is just awesome. It may be as quiet as a mouse behind all the double glazed glass and sound deadening inside, but outside it still sounded great.